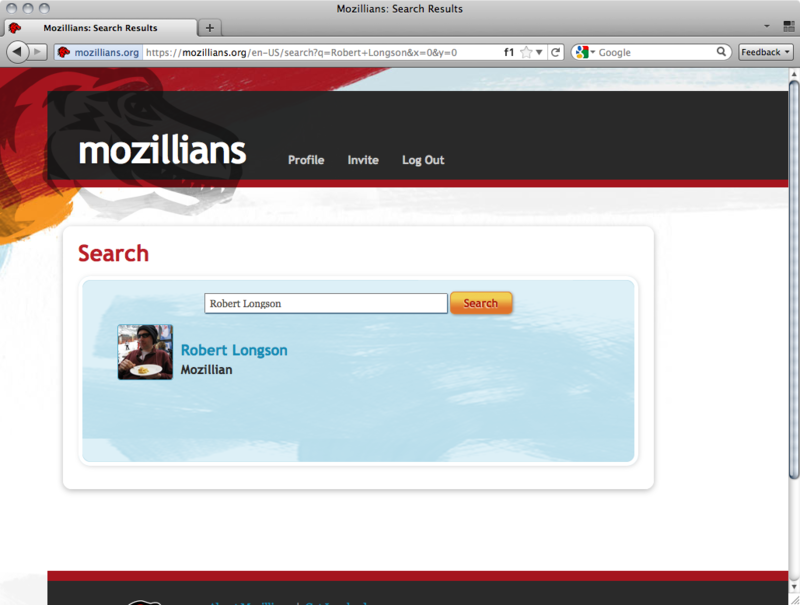 Mozillians.org is already useful, can’t wait for more | LegNeato! I was in Firefox Aurora bug triage and came across bug 692506. The bug is a SVG regression that shipped in Firefox 7. Even though we do our best, with the amount of code out there on the web some issues are bound to slip through. Luckily it’s not serious enough or widely used enough to create a Firefox 7.0.2 release but of course we want to fix it as soon as possible. Updates should leave users no worse off. When Boris defers to someone else, I get worried. He knows everything. If he doesn’t feel confident commenting on the risk it is likely in an area that requires crazy black magic…and likely risky. The fix is clearly right […] Looks like pretty good value for a 1 line change to me. Now, I had seen Robert’s name previously but I wasn’t as intimately familiar with his areas of expertise. 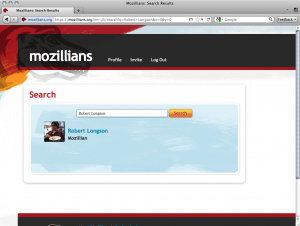 I remembered Mozillians.org launched recently and decided to see if it could shed some light on Robert to give his signoff additional weighting. So I searched. Luckily, I got a hit! 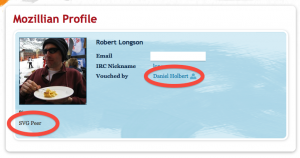 Looks like Robert is a SVG peer! If there was any doubt (don’t know why there would be) I have Daniel vouching for the information. Because I know Daniel, this is about as solid a confirmation I could get. So, now I have a heavy-hitter (Boris) writing the patch and a peer in the area of the patch (Robert) saying it is correct and safe. That makes taking the regression patch a no brainer. Mozillians.org helped to turn a fuzzy product decision into a clear one, reducing risk and making us more confident in a Firefox change. I also can’t wait for the tool to have timezone support so I know when community members I need patches from are available or not. Please add yourself if you haven’t already so we can make this resource even more valuable. Will BrowserID be used in Mozillians.org? I believe the plan is to eventually, yes.